2. Promoting Social and national Integration. 4. Developing Social, moral and Spiritual values. One to three years of pre-school education. A primary stage of 7 to 8 years divided into a lower primary stage of 4 or 5 years and a higher primary stage of 3 or 2 years. A lower secondary stage of 3 or 2 years of general education or 1 to 3 years of vocational education. A higher education stage of 3 years or more for the first degree course followed by courses of varying durations for the second or research degrees. The structural pattern thus recommended by the commission is commonly known as 10+2+3. Let us know the structural pattern of education. Pre-school education from 1 to 3 years should also be given. 3 years of lower secondary education. Higher secondary education should be fixed for 2 years. Degree course should be of 3 years. The age of admission to class I should not be less than 6+. The first public external examination should come at the end of the first 10 years of schooling. Secondary schools should be of two types : higher schools providing a 10 years’ course and higher secondary schools providing a course of 11 or 12 years. A new higher secondary course consisting of classes XI and XII should be introduced. The pre-university courses should be transferred from Universities and added to the secondary schools. The Commission has been suggested the reorganisation of the university stage. At this stage, the three year degree has been favoured by the Commission. 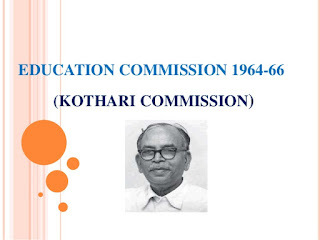 The Education Commission 1964-66 was appointed by the Government of India on July 14th, 1964. Dr. D.S. Kothari, was appointed as the Chairman of the commission. The Commission submitted its report on June 29th, 1966. The Commission set 12 task forces and 7 working groups; interviewed 9000 men and women interested in education in the country and toured for 100 days. The report contains 19 chapters. i) Not to limit its inquiry to specific sectors or aspects of education, but to have a comprehensive, review of the entire educational system. ii) Its firm belief that education is the most powerful instrument of the national development. iii) Its International Composition. The commission included 7 Indian members and 5 others; 1 each from Japan, France, U.K., U.S.A. and USSR. The objectives, as recommended by the commission were increasing productivity; promoting social and national integration; education and modernisation and developing social, moral and spiritual values. A new educational structure was also developed.